Introduction: Our hypothesis is that a CT scan may complement colonoscopy in preop localization of colon tumors.Erroneous tumor localization via colonoscopy creates a challenging intraoperative problem for surgeons. The ideal method to minimize these errors is unclear. In this study, we have examined the ability of CT scans to properly localize colon lesions, and potentially correct errors form colonoscopic tumor localization. Methods: A retrospective chart review on patients having surgery for colon malignancies between January 2004 and May 2006 at St. Francis Hospital, a tertiary care teaching hospital. Of the 305 patients with documented colon cancer , 104 charts contained all of the following data: preoperative colonoscopy report, preoperative CT report, operative report, and final pathology report. The main outcome measures: accuracy of colonoscopy, and CT scan in localizing tumors, and tumor size threshold for detection by CT scan. Results: Over all, tumor location was accurately determined via colonoscopy in 75/104 cases (72.1%). Thus there was a 27.9% error rate. CT scan accurately localized colon tumors in 48/104 (46.1%) of cases. Of the 29 tumors erroneously located by colonoscopy, 12 (41.4%) were accurately localized by CT scan. The average tumor size for all patients in this study was 5.72 (+/- 1.3) cm. The tumor size threshold for CT was 3.5 (+/-1.5)cm. 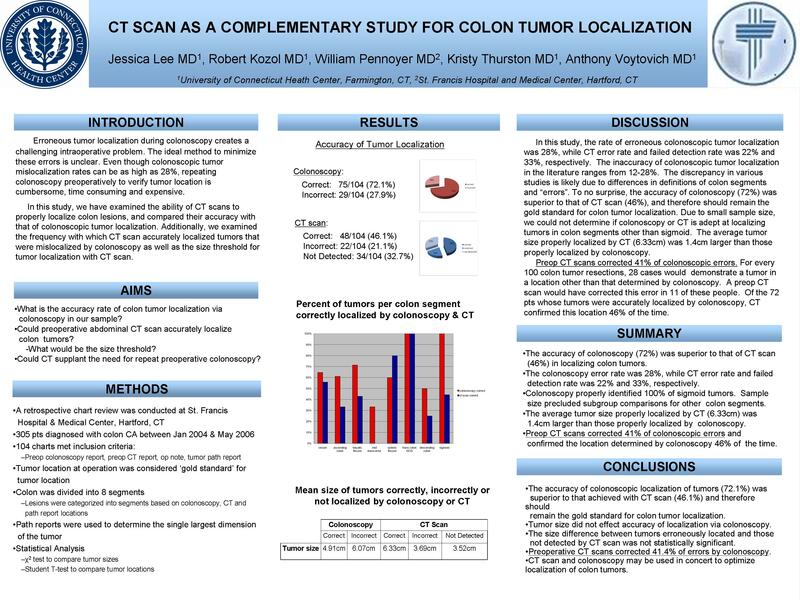 Conclusions: As expected, the accuracy of colonoscopic localization of tumors (72.1%) was superior to CT scan (46.1%) p< .05 and should remain the gold standard for tumor localization. However, pre-op CT scans corrected 41.4% of errors by colonoscopy. Thus CT may complement colonoscopy. This is of particular value for laparoscopic cases. Further investigation utilizing colonoscopic tattooing, CT and perhaps virtual colonoscopy should bring the error rate closer to zero.